We have a brand new poster for John Wick 3: Parabellum and, with any luck, we'll be getting a trailer in the very near future. 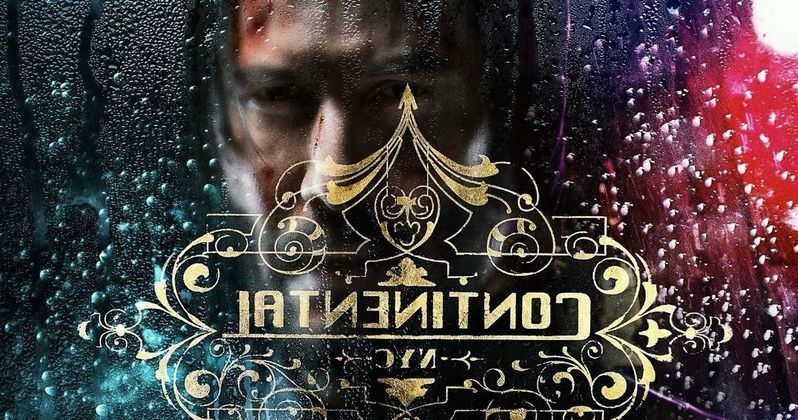 Lionsgate has released both a still and motion version of the new poster, which sees Keanu Reeves' legendary assassin looking worse for wear, caught in the rain and right back at a very familiar location; The Continental hotel. Even though he's been excommunicated, John simply can't stay out of the game and away from trouble. It's a stylish poster that does a bit more than the usual "here's the title of the movie and it's main star Keanu Reeves" or over-stuffed Photoshop posters that we see far too often. But that seems to suit the franchise which, from the beginning, has been very stylish. As for the trailer? It seems as though that may be coming our way very soon as well. The studio also released a brief teaser video, recounting the final moments of John Wick: Chapter 2, and the video's caption signals that something is coming our way soon. "And so it begins. Text 'John Wick' to 91099 for a one hour head start." Once the number is texted, a message is sent that says "We will text you at this number in the days to come. Be prepared." That certainly seems like a set up for the trailer. So be ready for Mr. Wick to be stacking up those bodies any day now. What we know is that this movie will see the titular character on the run as a huge price has been put on his head. And, believe it or not, it's already been promised that this movie will exceed its predecessor's body count. Keanu Reeves is joined by Ian McShane, Ruby Rose, Common, Lance Reddick, Laurence Fishburne, Hiroyuki Sanada, Jason Mantzoukas, Anjelica Huston, Boban Marjanovic and Halle Berry in the cast. Halle Berry will be playing a rather significant role in the sequel and, hopefully, if indeed the trailer is coming soon, we'll learn a bit more about how she fits into all of this craziness. Chad Stahelski, who co-directed the first installment alongside David Leitch and flew solo for the sequel, is back in the director's chair on his own this time around. It's been said previously that this will be the end of John Wick's journey. However, Chad Stahelski also indicated that they would be happy to make more and more sequels as long as people keep showing up. We've also still got The Continental TV series, which is being developed for Starz, to look forward to in the future. John Wick 3 is set to arrive in theaters on May 17. We'll be sure to bring the trailer your way as soon as it's made available online. In the meantime, be sure to check out the new poster from the official John Wick Twitter account below.